This article is about the recurring character from the WarioWare series. For other uses, see Joe (disambiguation). 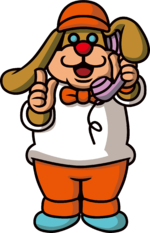 Joe is a dog businessman from the WarioWare series and Mona's employer. He originally owned the Gelateria as Gelato Joe in WarioWare, Inc.: Mega Microgame$!, but would replace it with Mona Pizza as Pizza Joe in WarioWare: Twisted! and WarioWare: Touched!, later go by the title Manager Joe in WarioWare: Smooth Moves and WarioWare: D.I.Y., and also work for the Diamond City Times as Editor Joe in Game & Wario. Manager Joe makes a minor appearance in the Mona Pizza souvenir in WarioWare: Touched! In WarioWare: Smooth Moves, Manager Joe is in Mona's story as usual, this time along with Ken the Reporter as an announcer of the Diamond City Roughs match against The Dinosaurs. Joe later appears working at a dumpling stand with Mona and her animals in Young Cricket and Master Mantis' story. The Japanese website for Smooth Moves shows that he is also the curator of the Temple of Form and the original owner of the entire area where it is located. According to the D.I.Y. Forums in WarioWare: D.I.Y., Manager Joe runs Diamond Software, the company that provides the game's pre-made microgames and was created when Wario's staff left WarioWare, Inc. Also in WarioWare: D.I.Y., Manager Joe can be seen in the beginning of Mona's stage as the cameraman. Editor Joe is featured extensively in Shutter, Mona's minigame in Game & Wario. He is the editor of the Diamond City Times newspaper and asks Mona to catch suspects on camera, giving the player instructions and evaluating the photographs sent to him. Joe appears during Mona's story in WarioWare Gold as the owner of Joe's Clothes, where he helps Mona choose an outfit for a party she is hosting. After finding the outfit she wants, Mona invites Joe to the party, before leaving on her scooter in a rush before Joe can help her decide what he should wear. He is later seen in the first stage of the Ultra League, as the owner of his own night club, Club Joe. He was about to close the club early as it is not full of patrons before Mona, along with Jimmy T., Dr. Crygor, Penny, Kat and Ana, Mike, Fronk, and Young Cricket and Master Mantis help him fill the club with patrons. Rank C – For an easygoing dog, Joe's pretty ambitious. He runs a boutique, a disco, and even more shops. Rank B – Each time shoppers get their fashions at Joe's Clothes, they earn points for his homemade hamburgers. Rank A – Those who dance until the morning hours at Club Joe will get a free breakfast, courtesy of Joe! ↑ Introduction to the Temple of Form at the official Japanese WarioWare: Smooth Moves website. "元々、この一帯の土地を所有しておりました私は、ダイアモンドシティの貴重な資産を市民のみなさまにひろく正しく理解していただそうと思い、このたび作法殿の一部を公開し展示することにいたしました。" ("I, the original owner of the entirety of this area, think all citizens definitely should understand about Diamond City’s valuable assets, and this time I opened one portion of the Temple of Form to the public for exhibitions.") Nintendo. Retrieved April 03, 2018. ↑ Japanese WarioWare: Smooth Moves character blog. Nintendo. Retrieved July 2, 2015. This page was last edited on April 14, 2019, at 21:26.